Giacomo Antonio Domenico Michele Secondo Maria Puccini (22 December 1858 – 29 November 1924) was an Italian composer whose operas, including La bohème, Tosca, Madama Butterfly, and Turandot, are among the most frequently performed in the standard repertoire. Some of his arias, such as "O mio babbino caro" from Gianni Schicchi, "Che gelida manina" from La bohème, and "Nessun dorma" from Turandot, have become part of popular culture. Puccini was born in Lucca in Tuscany, into a family with five generations of musical history behind them, including composer Domenico Puccini. His father died when Giacomo was five years old, and he was sent to study with his uncle Fortunato Magi, who considered him to be a poor and undisciplined student. Magi may have been prejudiced against his nephew because his contract as choir master stipulated that he would hand over the position to Puccini "as soon as the said Signore Giacomo be old enough to discharge such duties." Puccini took the position of church organist and choir master in Lucca, but it was not until he saw a performance of Verdi's Aida that he became inspired to be an opera composer. He and his brother, Michele, walked 18.5 mi (30 km) to see the performance in Pisa. In 1880, with the help of a relative and a grant, Puccini enrolled in the Milan Conservatory to study composition with Stefano Ronchetti-Monteviti, Amilcare Ponchielli, and Antonio Bazzini. In the same year, at the age of 21, he composed the Messa, which marks the culmination of his family's long association with church music in his native Lucca. Although Puccini himself correctly titled the work a Messa, referring to a setting of the Ordinary of the Catholic Mass, today the work is popularly known as his Messa di Gloria, a name that technically refers to a setting of only the first two prayers of the Ordinary, the Kyrie and the Gloria, while omitting the Credo, the Sanctus, and the Agnus Dei. 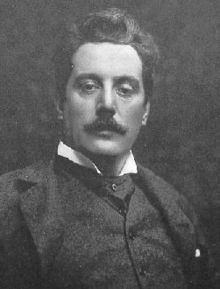 The work anticipates Puccini's career as an operatic composer by offering glimpses of the dramatic power that he would soon bring forth onto the stage; the powerful "arias" for tenor and bass soloists are certainly more operatic than is usual in church music and, in its orchestration and dramatic power, the Messa compares interestingly with Verdi's Requiem. Click here to view all items related to Puccini.